1. Be beautiful; 2. Be creative and productive; never stop studying and learning; 3. Be peace-loving, positive-minded; 4. Do not acceptcommunist philosophy; 5. 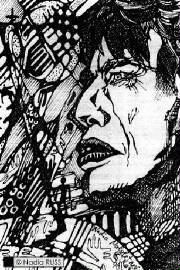 Be free-minded, do the best you can to move the world to peace and harmony; 6. Be family oriented, self-disciplined; 7. Be free spirited. Follow your dreams, if they are not destructive, but constructive; 8. Believe in god. God is one, it is harmony and striving for perfection; 9. Be supportive to those who need you, be generous; 10. Create your life as a great adventurous story. 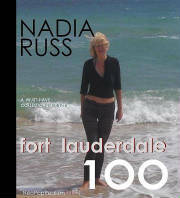 "Fort Lauderdale 100: A Must-Have Collector's Edition" by internationally known NeoPopRealist artist Nadia RUSS, with foreword by Mayor of the City of Fort Lauderdale John P. "Jack" SEILER, is dedicated to the City of Fort Lauderdale. In 2011, Fort Lauderdale -- the Yachting Capital of the World and 'Venice of America' -- has celebrated its 100-year anniversary. The book's pages include one hundred color photographs by Nadia RUSS of the beautiful and breathtaking, unique and amazing, greatly unbelievable, amusing, glamorous, sunny, sandy, fascinating and unforgettable City of Fort Lauderdale. Also, this account contains information on the sights. 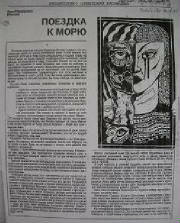 Published in the United States in English with the partial translation in Russian. Buy book at Amazon, click HERE. A book "New York City: After Sandy & Before the End of the World" offers a stunning collection of 110 Nadia Russ' photographs of the New York City's Manhattan, made a few days after hurricane Sandy and ... before the end of the world. 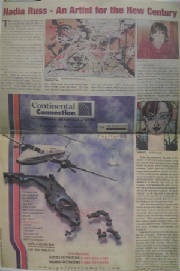 It includes text describing images. Buy black/white edition at Amazon, click HERE. Buy color edition at Amazon, click HERE. Nadia Russ, Seasons of Nightmare (2002), acrylic on canvas, 34"x34"
Nadia Russ, Cigar (1997), acrylic on canvas, 24"x24"
Nadia Russ, Rolls Royce Convertible (2006), ink, mix media on paper, 11"x17"
Nadia Russ, Rolls Royce d'Vinci (2006), ink, mix media on paper, 11"x17"
Nadia Russ, series "Faces", ink on paper, 2001, 8"x10"
Nadia Russ, The Game (2003), acrylic on paper, 22"x26"
Nadia Russ, Hand (2007), acrylic on canvas, 40"x71"
~Scroll down to see Nadia Russ' exhibition featuring on Bahamas TV, Channel 13, more. 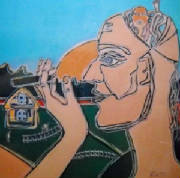 NADIA RUSS' works can be found in the museums' permanent art collections all over the world. *Manhattan Motorcars (Luxury Cars series), NYC, NY, USA-2006-2010; etc. Check selected magazines & newspapers..
Nadia RUSS is the founder of NeoPopRealism Journal, Wonderpedia, NeoPopRealism Starz International Art Competitions (2008-2010) and NEW MILLENNIUM ART (2010); participates as a Juror (individually or in a panel) in national & international art competitions. Russian Television, Moscow, 1995. TV program "THIRD EYE". 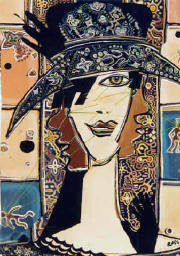 TV studio decorated with Nadia RUSS' NeoPopRealist work. 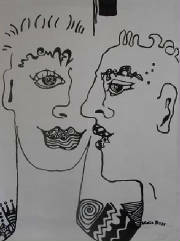 PS In Nadia Russ' paintings/drawings, you can often see the one eye faces, however, it doesn't have anything in common with Illuminati. 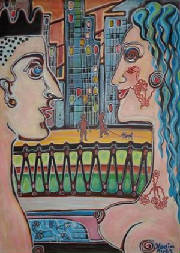 She paints/draw them since 1989. 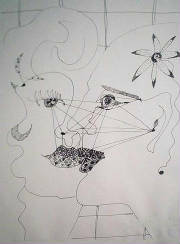 She began creating such types of faces in Moscow, when she did not know anything about Illuminaties yet. 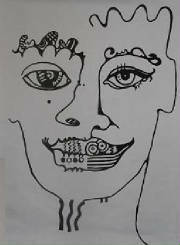 In Nadia Russ' work, the one eye faces or two faces in one reflect the psychological world of the humans, the hidden characteristics/character, the mood switch or fight between the good and evil (God ad Devil). 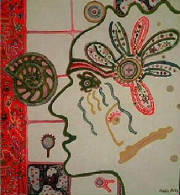 Those years, the third eye in Russia did not mean anything but wit and wisdom. Nadia Russ is not with illuminati-satanists and never will be, because her views are different (see 10 NeoPopRealist canons for happier life). The Nadia Russ' one eye hairdo photos (which reflect her drawings) also did not mean to promote illuminati, she just liked this hair style, which she invented for herself in 2012. 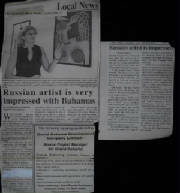 *Freeport, Bahamas, TV featuring - exhibit in Freeport Art Center, 1997; etc. This 226 pages nonfiction tells a story about the world we live in. It explains why decadence in our society has happened and how it is related to our values. Transparency is a powerful tool against those who are putting profit before integrity. 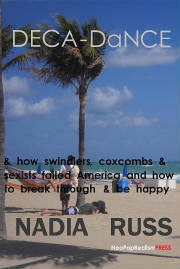 This book explores many aspects of our lives, including the corruption. It offers the solutions to problems and teaches how to improve your life and be happy. This account explores through the prism of relationships between people the variety of subjects - communism and capitalism, crime and corruption, sexism and love, elections 2012 and the government, much more. It is illustrated with photographs. Buy book HERE. Работы Нади Русс (Надежды Mалолетневой) находятся в собраниях музеев и в других государствнных и частных собраниях по всему миру. 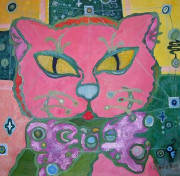 created by artist Nadia Russ. 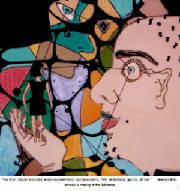 Word NeoPopRealism Nadia Russ created January 4, 2003. 10. Create your life as a great adventurous story. Membership is free. Volunteering is easy. Print NeoPopRealist commandments and spread between friends, family members, strangers. 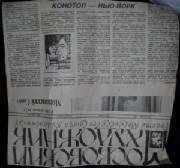 NY Arts Magazine, "Nadia Russ: NeoPopRealism"
Panorama (Ukrainian newspaper), "Nadia Russ. NeoPopRealism Konotop Origin"
Nadia Russ's Shcolar Article "NeoPopRealism Evolution"
Nadia Russ, "Four Faces." 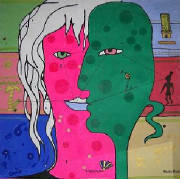 Acrylic/Canvas, 36"x36"
You would like to try NeoPopRealist drinks created according Italian-Russian-Bahamian-American taste? Drink "NeoPopRealist Key" - Mango Rum, Coconut Rum & Pinaple Juice. You can make it. 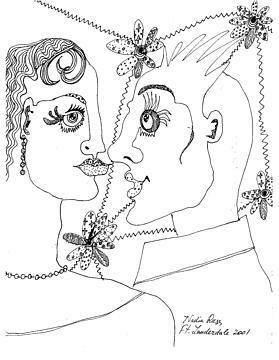 Recipies created by artist Nadia Russ and ex-restaurant manager and now mathematician Joe Quagliata, Summer of 2006 in NYC. THE resource for Stamp Collections! *Manhattan Motorcars (Luxury Cars series), NYC, NY, USA-2006-2008; etc. 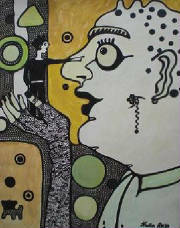 *The New York Art World (2004, NYC, USA), *Calendar 2007, published by Artperiscope.com (Poland), *Sumy Panorama (2007, Ukraine), etc. *5 minutes live on Moscow TV - featuring book of humorous stories "I murdered a Man" (written & illustrated by Nadia Russ), 1994, Russia; etc.